Fresh from the boule, GaAs wafers need a whole ton of processing to become useful bits in your cell phone or airborne radar. We are microwave guys, so we are gonna give you the short version of this. The first thing that needs to be done is to "grow" some specific layers onto the wafers. These layers form the basis for microwave semiconductors; wafers that have these layers are called "starting material". At this point your material must be kept in a clean room, preferably class 100. Here's a picture of six-inch GaAs starting material given to us by Xpert Semiconductor of Taiwan. 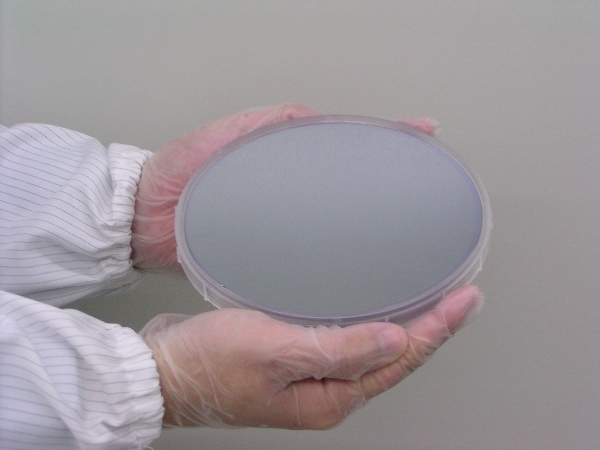 Xpert is a supplier of epitaxially-grown GaAs wafers, in both four and six inch diameters. Thanks, Angela! The semiconductor area of a FET is built on top of the semi-insulating substrate.Â Layers of N-type material are grown on top of the substrate. The lowest layer is called the buffer layer, it forms the transition from the semi-insulating to the semiconducting layers. The channel layer (doped with N) is where the FETs are realized. A top layer of N+ is added above the channel, which is used as the contact area for the ohmic source and drain contacts. The N+ must later be removed where the FET gates make Schottky contacts to the channel. Saying that FETs need only two layers of semiconductor (N and N+) is a huge over-simplification. A lot of time and money has been spent by GaAs IC foundries perfecting different profiles within the channel, and different RF requirements such as low noise figure or high power require different starting material. The doped layers are grown or implanted on top of the semi-insulating GaAs using epitaxy or ion implantation.Â Epitaxy involves building up additional crystalline layers on top of the starting material, either through metal-organic chemical vapor deposition (MOCVD) or molecular beam epitaxy (MBE). Ion implantation is a high-volume method most often used in the simplest MESFETs.Â In this process no new material is grown, but the starting material is bombarded with atoms of the required dopants to create the N and N+ layers.Â Different energy doses are used to slam the dopants to different depths, which provides the versatility of different layers.Â Ion implantation tends to add stress to the GaAs wafer which must be considered; wafer annealing is often required after implant to reduce the stress.Â Implantation is a cheap, high-volume process that originated in the silicon world. The active channel of PHEMT is a mixture of indium and gallium in arsenide. In28Ga72As means that 28 percent of the GaAs atoms have been replaced with indium. Binary and ternary compounds are further discussed on this page.